HOUSTON, Texas (KTRK) -- This weekend, you will notice a big milestone in the Highway 288 toll lanes project. Two new direct connector ramps are opening at the South Loop interchange. The 610 eastbound ramp to SH-288 northbound will open, as well as the 610 westbound ramp to SH-288 southbound. You will still see the old ramps, but not for long. Here's a look at what to expect from the construction on SH-288. 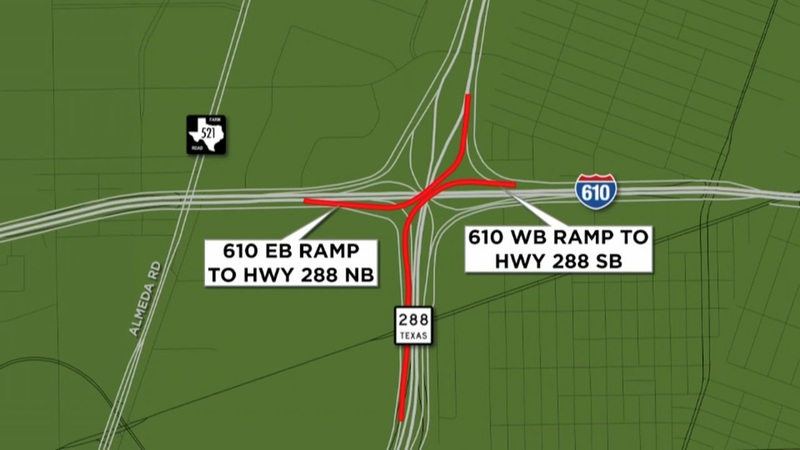 Later this month, crews will have to shut down 288 in order to tear down the old ramps. We will keep you posted on those closures.